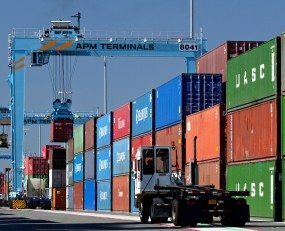 A new block (unitary) train service from APM Terminals Lazaro Cardenas in Mexico has been launched, avoiding congestion and delays at other ports to reach hinterland destinations in the US and Mexico. Since the APM Terminals Lazaro Cardenas opened in February last year, there has been an increase in eight vessel services calling each week. The terminal provides the shortest distance and lowest intermodal cost to Mexico City. Two unique block train services were successfully piloted, one to Mexico City and another across the US border to Houston. The pilot demonstrated that APM Terminals Lazaro Cardenas provides an excellent alternative for avoiding congestion and the risk of delays commonly associated with services in many terminals in Long Beach, Los Angeles. Shippers recognized the less-congested port saves time, with forwarders reporting dwell times for cargo via Long Beach to inland destinations of between five and seven days, and sometimes even more. In comparison, APM Terminals Lazaro Cardenas is much faster from vessel discharge to rail connection due to its on-dock rail capability with two dedicated rail mounted gantry cranes, and lower move count. APM Terminals Lazaro Cardenas also has its own rail customs inspection facility with 34 dedicated bays that speed up and simplify the container inspection and cargo clearance process. The train services to Mexico City and Houston is now fully implemented. With an established fixed weekly departure, the transit time for the train from APM Terminals Lazaro Cardenas to Houston is six days, the same as the rail service from LA. In partnership with logistics provider Damco, units can be transferred within 24 hours using customs clearance procedures. Cargo is pre-cleared using routing developed for Canadian gateways. The whole customs procedure is managed by APM Terminals. The train service pilot to Mexico City focused on eliminating dwell times in other congested gateways and securing cargo whenever trucks were stationary on city streets. To date, 99.98% of train moves from the Terminal have no security claims. The non-stop weekly rail departures delivered transit times to Mexico City comparable to those from LA and faster and more reliable than from Manzanillo.